Rising interest rates, escalating trade tensions, the longest streak of monthly employment gains on record—these are just a few examples of new factors affecting the U.S. investment climate since last summer. So, how did cross-border investment in U.S. commercial real estate (CRE) during the first half of 2018 compare to the same period in 2017? The short answer is that total cross-border acquisition volume increased by 27% year-over-year during H1 2018. The long answer is more nuanced. First, it was particularly strong cross-border investment during Q2 that propelled volumes for the first half of the year. While cross-border investment during Q1 was roughly on par with the prior four quarters the $18.6 billion posted in Q2 has been exceeded in just four other quarters since 2001 (the earliest date for which RCA data is available). Second, one transaction was the primary driver of the year-over-year increase in Q2 (and thus H1) cross-border investment. French company Unibail-Rodamco’s entity-level acquisition of Westfield that included a $7.7 billion portfolio of shopping malls. The Unibail-Rodamco acquisition also impacted the most popular property types and top capital sources for cross-border investment. Retail accounted for nearly half (46%) of total cross-border investment in Q2 and the largest share during the first half of 2018 (28%). In contrast, the retail sector accounted for just 8% of cross-border investment, on average, from Q1 2015 to Q1 2018. Setting aside the anomalous quarter for retail investment, it is the industrial sector that has been consistently capturing greater interest from foreign buyers. Industrial accounted for 21% of cross-border investment in Q2 and 25% during H1 2018, up from an average of 13% from Q1 2015 to Q1 2018. Drawn by attractive returns, foreign buyers acquired $8.3 billion in industrial assets during H1 2018, an increase of 226% from the same period in 2017. The Unibail-Rodamco acquisition made France the top country of origin for cross-border investment in Q2, accounting for 44% of all activity. France has not previously been a major player, with a quarterly average of just $193 million between Q1 2015 and Q1 2018, compared to $7.9 billion in Q2 2018. In recent years, Canada, China, Singapore and Germany have been the major players in U.S. CRE investment, and are the only countries with average quarterly investment of at least $1 billion over the last three years. After France, these remained the top capital sources during the first half of 2018, but investment volume decreased from all four countries relative to the same period in 2017. Among the top four countries, investment from China appears to be decreasing at the fastest pace. After a strong Q1, Chinese acquisitions plummeted by more than 90% in Q2. Chinese acquisitions totaled just $345.5 million in Q2, compared to a quarterly average of $3.4 billion between Q1 2015 and Q1 2018. The implementation of capital controls is likely contributing to the pullback in Chinese investment activity, but it is difficult to gauge the true impact. Another complicating factor is that some Chinese investors skirt the restrictions by routing capital through entities they have established in Hong Kong. During H1, investment from Hong Kong was up 20% year-over-year. However, like in China, there was a big drop after Q1— investment from Hong Kong totaled $93.5 million in Q2 compared to a quarterly average of $538 million between Q1 2015 and Q1 2018. We will have to stay tuned to see whether this was a quarterly fluctuation or part of a larger trend. Meanwhile, Singapore is picking up where China has left off. 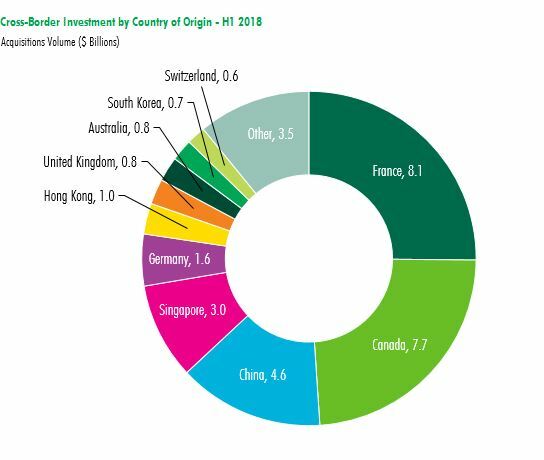 Over the past year, Singapore’s $9 billion in U.S. investment has trailed only Canada (though China still edged out Singapore during H1 2018 due to a stronger Chinese activity during Q1). In three of the past four quarters, Singapore’s investment activity outpaced China’s by a ratio of nearly 8 to 1. Still, Canada remains the most consistent source for investment. Canada has had a quarterly average of $5.1 billion since 2015—60% higher than China (the second-largest investor) over the same period. Several other countries boosted investment significantly during H1 2018, primarily in Western Europe. Among countries investing at least $200 million, cross-border acquisitions increased by more than 100% relative to H1 2017 for from buyers from the Netherlands, U.K., France, and Spain, as well as Australia, UAE, and Mexico. Overall, strong economic growth in the U.S., coupled with the global search for yield, is expected to sustain cross-border investment at levels similar to 2017 through year end of 2018. As the global economy continues to evolve, and often surprise, over the remainder of the year, the balance of investment across property types and the distribution of capital origin sources may continue to shift.